Today's update for the Twitter app on Android devices just made tweeting 140 characters a little easier thanks to a much-needed redesign. 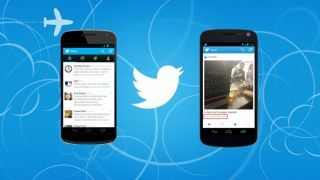 "Its new design reflects a native Android experience," said Twitter technical lead for Android Jonathan Le. First and foremost, that translates into a Twitter app with wider and taller timelines which make use of a device's entire screen. There's also a flat navigation bar, and the ability to tap and hold for quick actions. Twitter users on Android can now quickly navigate between tabs by swiping across their phone or tablets display. Another time-saving perk to today's update is the ability to see username and hashtag suggestions when a user begins typing his or her tweet or initiates a search. While the Twitter app update for Android received most of the social networking company's love, there were some design tweaks for the iPhone and mobile versions, too. "All three mobile apps, plus twitter.com, now show more types of content in expanded Tweets," announced Le. This expandable content includes photo galleries, apps, and product listings. Twitter users will notice that there is a new link below embedded content that is shared from another mobile app. Now, if a user clicks a link below a Foursquare check-in or Flickr photo it'll send them from the Twitter app to the native mobile app - not the website, which probably doesn't have them logged in. Twitter, playing nice with other social media companies, will even send users to download the linked app if it's not already installed. The Twitter updates for Android, iPhone, the mobile web are rolling out over the next several days, according to the company. However, Android owners who still have Twitter app version 3.8 or lower can go straight to the Google Play and update to Twitter for Android 4.0 today. iOS device owners are also seeing the Twitter app, version 5.5, in the Apple App Store right now.